A few years ago we published a feature article on Billy Vaughn — king of the “cover recording.” That article started a conversation among the contributors to Popularsong.org about cover versions, and more specifically, which version of a “standard” should be thought of as the standard. Conversation kicked into high gear when the topic of Lee Hazlewood‘s “Jackson” came up. Johnny Cash recorded it first with June Carter, which topped the country charts, and made a small mark on the pop charts as well. Hazlewood covered it shortly afterward with Nancy Sinatra, and it fared very well on the pop charts, probably selling about as many overall as the Cash/Carter original. Today the better known version is Johnny and June’s. The odd thing is that most casual listeners pick out the Lee and Nancy version as the one they prefer — and then insist that they’re listening to Johnny and June! It’s probably a toss-up as to which is better, or which is the standard. Speaking of Johnny Cash and June Carter, another duet of theirs that raises similar questions is Tim Hardin’s “If I Were a Carpenter.” Hardin hit the charts first, but was eclipsed by a cover version recorded by the great Bobby Darin. Cash turned it into a powerful duet, for which he and June won a Grammy Award. Joan Baez got into the mix with a folksy version, and for a while, Ramblin’ Jack Elliott’s version got a lot of airplay. Which is the standard for this standard? Darin? Cash & Carter? Depends on which style you favor. Another Johnny Cash classic that comes up from time to time as a “pop standard” is Kris Kristofferson’s “Sunday Morning Coming Down.” This was originally released as a single by Ray Stevens in 1969. Stevens, you may recall, is best known for novelty songs such as “The Streak” and “The Shriner’s Convention.” Anyway, Stevens’ version of “Sunday Morning Coming Down” fared well on the charts, but has been more or less forgotten after the impact of Cash’s 1970 version, which won CMA Song of the Year. The song was then covered by countless artists; we imagine Billy Vaughn must have given it the sax treatment at some time or other. Back to Ray Stevens for a moment; let’s consider the pop standard “Misty.” You know, the Johnny Mathis song. 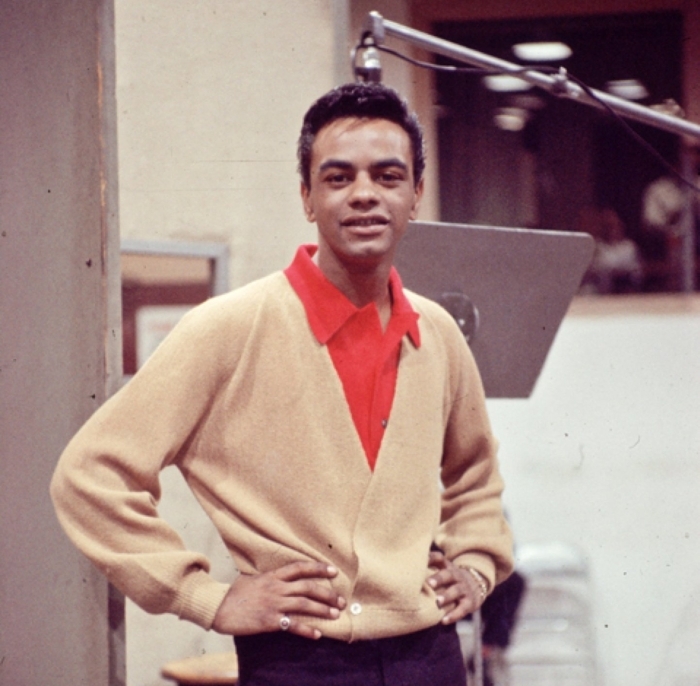 The Johnny Mathis signature song. It may surprise you to learn that Johnny’s 1959 recording only reached #12 on the pop charts. The song was written and recorded by Erroll Garner a few years earlier, but it wasn’t until Mathis’ recording that it became a classic. Then the song was immediately covered by everyone from Frank Sinatra to Ella Fitzgerald. The only other version of “Misty” from this era to chart was the cover by Lloyd Price in 1963, which reached #20. Mathis meanwhile continued to open shows with “Misty,” it was definitely his tune until 1975 when Ray Stevens re-recorded it as a bouncy, uptempo country song. That version tracked all the way to #14 on the pop charts, and was so highly regarded that it ranked in the Billboard Top 100 of 1975 — and scored Stevens a Grammy for “Arrangement of the Year”! A few years later when the Academy realized that Stevens’ “Misty” was the only version so honored, they put Garner’s original in the Grammy Hall of Fame. It wouldn’t be until 2002 that the Mathis recording would finally be recognized with the same honor. For many standards — including “Misty” — the standard has been that which sold the most copies. But for some songs, that is not the case at all. In our feature article on Billy Vaughn, we note that as musical director for Dot Records, Vaughn was responsible for the soft sounds of Pat Boone’s cover hits. In many instances Boone’s covers outsold and outcharted the original; Little Richard’s “Tutti Frutti” is a perfect example. In retrospect, however, Boone’s version is scarcely remembered other than by septuagenarians who once swooned at the sight of those white buckskin shoes. Some pop standards simply won’t be pinned down to a single artist. Perhaps the best example of this is Richard Rodgers and Oscar Hammerstein II’s “You’ll Never Walk Alone” from the musical Carousel. The song was first performed by Broadway star Christine Johnson, but was quickly covered by a number of pop vocalists, including Frank Sinatra, Judy Garland, and Mario Lanza. Perry Como recorded an extremely popular version a few years later, and then two versions were associated with the song when the film was released in 1956. Then Mahalia Jackson recorded a classic version in 1961, while Doris Day did a straightforward but haunting version in 1962. A couple years later Gerry & The Pacemakers did a version that rocketed to #1 in the UK, and is to this day an “anthem” played at soccer games in England. Elvis hit the charts in 1969…so whose is best known? Perhaps Jerry Lewis, who concluded his Labor Day telethons with the song? The answer, really, is none of the above; the song simply transcends any individual artist.